November 7, 2015, Dunedin, FL — Dan Klosicki has won back-to-back titles. For different teams. 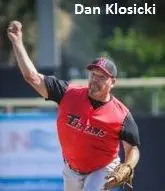 The Southern Maryland Titans pitcher threw a complete game and struck out four to guide his current team to the 52 National Division championship on Saturday afternoon at Florida Auto Exchange Stadium. It was the Titans sixth title since 1994. Southern Maryland defeated Lowkey Brewers 5-2, and Klosicki was named MVP. The Titans fell behind early, as the Brewers’ Dan Cuff scored an unearned run in the first inning, while Lowkey added another in the fifth when John Hartman stole second and scored later in the inning. Lowkey’s starting pitcher, Mike Smith, who played professionally for the Baltimore Orioles, cruised through the first five innings, striking out three and allowing just five hits. However, the Titans would load the bases in the sixth and tie the game 2-2 when J.B. Brown and Frank Bons scored on sac fly by Leonard Phillips and a RBI walk by Rafa Fuentes, respectively. “I knew we were going to score runs,” Titans manager Mike Steinhauser said. “We’d been in position all week, we’d scored runs all week, so I knew we just have to be patient and Dan would keep us in the game. He always has. He takes control — he’s a bull out there.”The Titans scored the go-ahead run in the bottom of the seventh when Brown would score for the second-straight inning thanks to an RBI single by Bons. The Titans tacked on two more runs in the eighth, both unearned due to errors. Phillips would score and then back-to-back bunts by Spike Slater and Fuentes brought him around, while Slater also scored. Smith would also pitch a complete game and strike out five, however, the infield errors nipped any comeback quickly. Now, Klosicki will head home with his seventh title in hand.